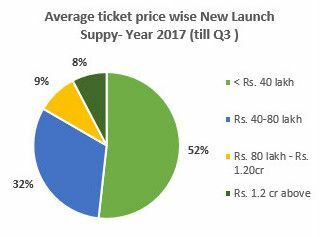 In MMR, the new launch supply in this segment is led by the Ambernath, Badlapur, Neral and Karjat micro-markets. Skyrocketing property prices, land saturation, and subdued demand for mid-range homes in the tier I cities have led buyers and investors to explore more cost-effective markets in non-metro (Tier II & III) and suburb cities. Improving overall connectivity is helping these cities to grow faster than before. Additionally, several Government schemes and initiatives such as Smart Cities, AMRUT and Swachh Bharat have given an impetus to the growth of these cities. 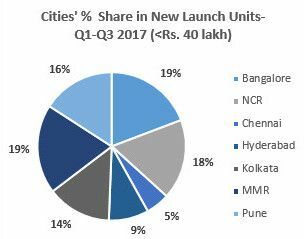 As per recent estimates, real estate Investments in Tier II & III cities has risen by around 17% in 2017 (till August) over last year – a certain sign of buyers’ and investors’ movement toward such cities. Jaipur, Chandigarh, Amritsar, Sohna, Lucknow, Nagpur, Surat, Vadodara, and Visakhapatnam are some of the key cities which are witnessing more real estate action of late. The development of physical and social infrastructures can help better in push affordable housing demand even in the larger cities. Distribution and expansion of business and employment centers such as IT- SEZs, IT parks, business parks, townships with mixed developments, and manufacturing units towards peripheral and suburban areas of the core cities will be key catalysts for renewed housing demand.